While the wait is on for the Samsung Galaxy S10, due for release 20 February, another Samsung phone was revealed in South Africa earlier this month which might have flown under the radar a bit. The midrange A-series has been updated with the Galaxy A9, with Samsung not scared to go full tilt on the camera capabilities. At the back you will find four rear cameras, with the brand in blue claiming it’s the world’s first quad-camera setup. What do these four lenses do you ask? First up is an 8 MP ultra wide camera offering a 120º wide-angle view. Next is the 10 MP telephoto with 2x optical zoom to help you crop your portraits a bit better. 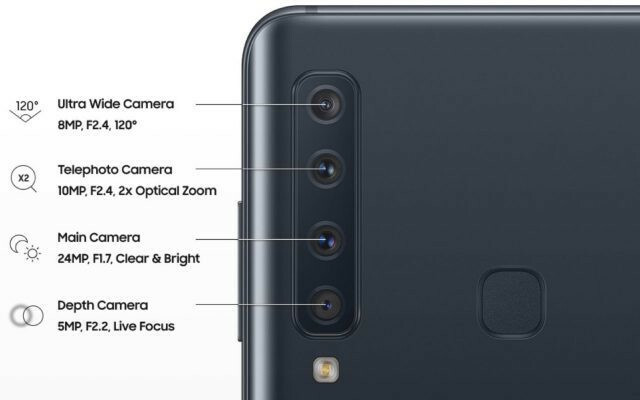 And finally, the 5 MP depth camera and 24 MP main camera work together to adjust the depth of field, blurring out the background, which will single-handedly improve most of your photographs. Samsung also tosses in Scene Optimizer, which chooses between 19 different modes to help with your shot, and Flaw Detection, which alerts you to things like people blinking during a pic. Don’t forget the 24 MP front facing camera, which brings the number up to five. In regards to screen size, the A9 offers an edge-to-edge 6.3” Infinity Display with 1080 x 2220 pixels. There’s a juicy 3800 mAh battery stuck inside, with 128 GB internal memory capacity, expandable to 512 GB if you want to buy a microSD card. Powering the unit is the quad-core Qualcomm SDM660 Snapdragon 660 chip and 6 GB of RAM. Android 8 is inside, although you can expect an upgrade to 9 during the course of the year. Traditionalists will be happy that a 3.5mm jack is included in the setup. The Samsung Galaxy A9 retails for R12 000, certainly claiming the higher end of the midrange spectrum. Having said that, the unit looks tech heavy and should last you more than two years.